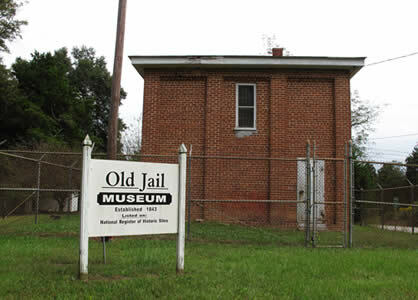 Old Jail is Listed on the National Register of Historic Places, May 1989. The Jail is an intact example of a late19th century jail facility in the form of a two-story, square, masonry block building topped with a pyramidal roof. All four exterior walls have two large brick panels which form pilasters on each side, and wrap-around brick pilasters are also used on each of the exterior corners, thereby reinforcing the building’s fortress-like appearance. The intact iron jail works are pre-fabricated products of Southern Structural Steel of San Antonio, Texas. Original hardware, including steel plate doors and iron bars on windows, is still in place on both floors. The jail is a good example of the type of building constructed for use as a county correctional facility. Its brick construction, compact massing, and prefabricated iron jail cells are all characteristic of many county jails in Georgia in the late 19th century. An interior brick chimney rises above the roof. In later years heat was provided by a small coal-burning stove. The ground floor of the building is thick concrete and the interior walls are exposed painted brick. The upper floor, stairway, and roof structure are of wood. The Crawford County Jail is different in that unlike many other jails of this period, it did not incorporate the jailer’s or sheriff’s living neither quarters nor a kitchen. Local oral history has it that the sheriff’s wife prepared meals for prisoners which were brought to the jail by the sheriff or a deputy. A water tank and piping that supplied water to the cells are now gone. Water was delivered to a gravity-feed tank by various types of vehicles. There is a modern flush toilet, obviously a later addition to the original facility, on both floors. The jail was the only county jail facility in Crawford County from its construction in 1888 through 1972. It is also one of the few remaining buildings representing Knoxville’s historic status as the County Seat. It was contracted to be built at a cost of $3,563.38 by the Crawford County Commissioner of Roads and Revenues who also guided its design. The builder was Thomas B. Artope, a marble and granite dealer in Macon Georgia. It is positioned on a small flat triangular lot approximately 1/4 mile from the historic Crawford County Courthouse and across Georgia Highway 42 from the current Courthouse. It is one of the few surviving buildings of Knoxville prior to the development of the nearby rail-community of Roberta.